NORTH CENTER — The first day of college is both exciting and nerve-wracking for any first-year student, but then, not every student is Roque. Accepted this year as a part-time student at Northeastern Illinois University, the 18-year-old from Gage Park has made it it a long way from his high school experience, much of which was spent hopping from friend's house to friend's house as he worked to focus on school. Also unlike most of the other students, his first day was documented on camera. 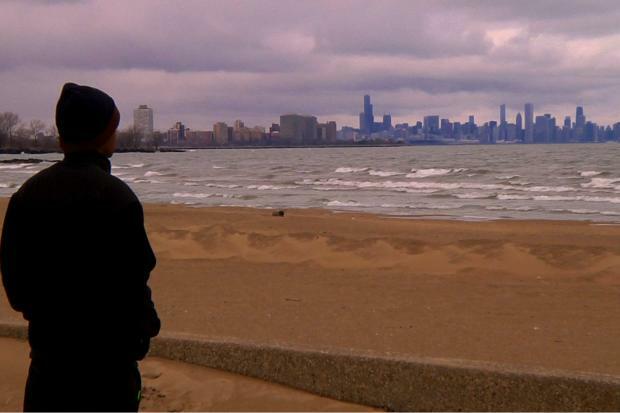 Roque is one of three young adults whose stories of homelessness are told in "The Homestretch," one of the select documentaries chosen to present at Good Pitch Chicago on Tuesday. Filmmakers requested the last names of the documentary subjects be withheld for their privacy. Good Pitch pairs filmmakers hoping to raise cash with a room of connections, which directors Kirsten Kelly and Anne de Mare hope will lead to more support for "The Homestretch," co-produced by North Center-based Kartemquin Films. The documentary, still in production, follows its subjects through the challenges of graduating from high school, attending college or simply surviving on their own. Kelly, who lives in New York but spends time in Chicago directing students through CPS Shakespeare!, stumbled upon the idea for the film about four years ago, when she discovered one of her students was homeless. "I had these stereotypes, of course, of what homeless kids were or what homelessness [is]," Kelly said, "And this kid broke every single stereotype and was getting good grades, talking about the future, trying to go to college." He was about to graduate from high school and move on to other projects (he now works as a reporter, Kelly said), so instead of being a subject for the film, he and another homeless CPS student consulted with the filmmakers to help them understand the many ways students cope. "We really wanted to kind of break the stereotype of it's just kind of the runaway kid sleeping under the bridge,'" said Kelly, who stressed that youth homelessness isn't just kids living on the streets, but those who live from couch to couch. Since 2010, the filmmakers have followed Kasey, from Bronzeville, now 22, and Anthony, from South Shore, now 21. Roque's story came later, when his teacher along with Kelly, then Roque's Shakespeare director, asked if he might want to be involved. At the same time as Roque dealt with constantly moving in and out of homes, he began performing Shakespeare. He started with "Romeo and Juliet" his sophomore year, then "The Taming of the Shrew" and finally "Hamlet" his senior year. "It was difficult at first," he said. "It's Shakespeare, and not a lot of people can master Shakespeare." But performing gave him the confidence to think, "I could do this stuff, and I could act, and I’m not so bad at it," Roque told DNAinfo Chicago. "And I could do it while sending out a message [that's] positive for people." Over the course of his junior and senior years, he worked hard to raise his GPA so he could get into college, he said. All the while, he let Kelly and de Mare film his chaotic life. "I guess it was hard just in general because it's opening up to a public view of what you are going through," he said. "But I think that could really benefit on the awareness of the issue, and I really trusted Kirsten, and I really grew trust for Anne." That trust was crucial in choosing the kids who would spend years sharing their lives, Kelly said. Kelly and de Mare, who have known each other for about 14 years through film and theater projects in New York, had a mutual understanding early on that they would try not to voyeuristically follow the teens, Kelly said. "We’re human beings, and if a kid is hungry, we’re going to take them to get a sandwich," Kelly said. "We were people in their lives, because the more we filmed the more connected we became." The filmmakers connected with Teen Living Programs, The Crib and CPS' Students in Temporary Living Situations to find subjects for the film. The public school program alone had 18,669 out of about 403,000 students registered last year, CPS said. As for Roque, his ambitions don't stop at stepping onto a college campus. He said he now dreams of becoming a psychologist, so he can help other kids. "To be able to walk into that first day with him and just see his confidence," Kelly said. "He worked for this goal, and he got it, and now it’s a new set of goals. That’s neat." "It's been an amazing project to work on," de Mare said. "And I hope that the movie is moving to people, and I hope they connect to it."